Thank you for the lovely fonts you offer. Missed R,T & voted for them to repeat. Will you be offering this font again? I would like to vote for the "T" of this pattern. Is there a way to do this? I hope you are planning to resend the t since the site was down the day it was supposed to be posted. I would really appreciate it. Thanks. 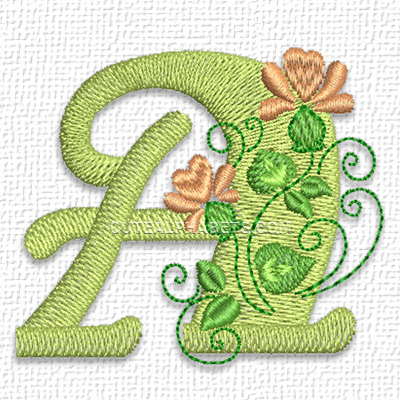 Hi, Could you please let us have the L of the pretty flower font.Because of electricity loadshedding I could not download the L.
@robbie32465: there are no subscriptions on Cute Alphabets site. You must be confusing this site with Cute Embroidery. Although they are owned by the same company, they are not the same site. I cannot download and I have subscription What do we pay for? This set does look lovely; would you please consider offering us another set with the same letters but without the flowers at some time in the future? - I think the letters as you have designed them would look very striking on their own and have many uses; thanks again for all the lovely designs you create. Something different - bold and striking! This font is very, very pretty. I really like the way the flowers/vines curl within the letters.